Today, I’m going to provide a MLM Gateway review. As a quick disclaimer, I am a very HAPPY customer and affiliate with them. I use their services daily and get a HUGE value from it. But when you really consider it all, there was never a true social media site for network marketers, until MLM Gateway started. Some of the best leads and recruits you can get are people who have been, or still are, involved with a MLM Company. Maybe they were frustrated and left for various reasons or maybe the company ceased operations. Well MLM Gateway is full of people like them! MLM Gateway is based out of the Czech Republic and it is free to join. It is considered a social lead generation platform. First things first… You can create a free MLM Gateway account by visiting their website and clicking free sign up. To the best of my knowledge, their service is available in every country in the world. Once you have an account, you go to your profile and edit it. You add information such as your city, state, email address, businesses that you are interested in, businesses that you are not interested in, and your business opportunity. You should also include your photo. What you see below is what your profile page will look like. Keep in mind that part of my video is cut off in this photo. Also, your business announcements get listed below your video. When you sign up, you will receive five credits. You can also get more credits by purchasing them, referring new MLM Gateway members and other tasks inside the system, such as writing articles. Another really cool part is how you can promote your business by writing business announcements and actually earn credits by doing so. It must have at least 400 words and can contain two links to your website, blog or MLM business page. When you write an article, it earns you ten credits, plus you get free exposure to the links in your article. As a premium paid member, you are called a PROFESSIONAL. The fee is $24.95 per month or you can pay quarterly like I did, for about $60. You can cancel your membership at any time. I personally chose this membership level because I see the value in it. $25 is chump change, compared to what you could spend on other types of advertising. What you see below is the page in the back office where you can create ads. As you can see, this is pretty much a no brainer. It’s hard to believe people still ask questions like this. No. MLM Gateway is NOT a scam. It is a legitimate service to generate leads for your business and connect with other network marketers. If it works for me, I’m sure it can work for you as well. Like any social media platform, you dare not “spam” members. But they all do know you have a MLM Business, so they expect offers. If you approach it professionally, you can gain some great leads. Join as a FREE member through my affiliate link and I will send you 100 aged USA MLM Leads. These leads are 30 to 60 days old. You will get their name, email, phone number, address, the date they requested more information about working from home, etc. The best way to reach these folks is by email or text. After you make your purchase with MLM Gateway, send me an email to chuck@onlinemlmcommunity.com and forward me a copy of the email you received creating your account, and then I will email the leads to you. I cannot say anything negative about MLM Gateway. I believe it was an excellent idea and I do suggest you use it as one of your lead generation mechanisms. I wouldn’t count on this site alone, but it is an added venue that can help you grow your business. I do highly recommend you visit MLM Gateway and create a free account and see what it can do for you. Update: This post was originally written by Greg. 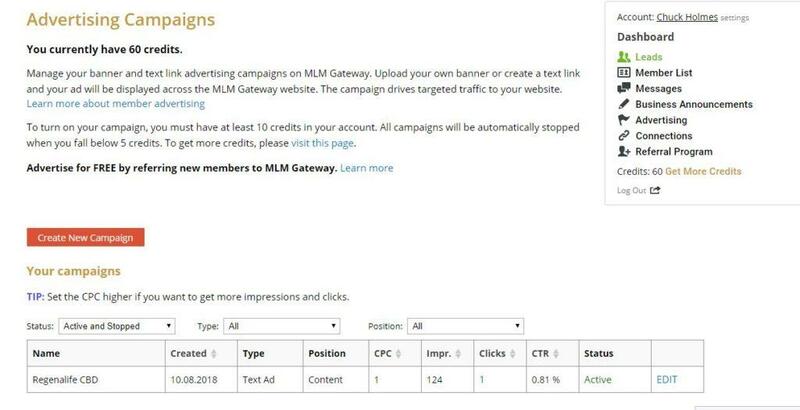 After Greg wrote this post for me, I went to MLM Gateway and checked it out, since I had not done so previously. Once I did a little research, I realized it made sense, so I joined on the spot. After doing that, I came back to this post and re-wrote it to what you see now. Therefore, please know I am an independent affiliate with MLM Gateway. I’ve joined in November 2018. I am not happy with the results. 1. I referred 47 people to this forum and I have earning commissions on the sales of these referrals. I have not received a commission payment to date. 2. I received 4 leads which resulted in zero signups. I researched the leads to see if they were actually human beings. Guess what…. No results. I cannot find none of the leads on social media. Plus to connect / open communication with a lead it costs 20 credits. So the leads are fake and you wasted 20 credits per lead. 3. I guess its suppose to be a great forum to promote your business. Other business owners tend to throw up their business on you. So its been a great waste of my time and energy. Beware of MLM Gateway forcing you to waste money on credits and getting no results. The minimum payout is $100. That’s probably why you haven’t been paid yet. Most of the leads will not result in signups, maybe in 1 in 100. That is normal with any platform. I’ve acquired more than 10 reps/customers from MLM Gateway so I know it works. Their PPC platform is out of this world for driving people to your website. Promoting your business there is the wrong approach. What you should be doing is connecting with other people and using attraction marketing. Everyone there is there to promote their business. You have to find a way to be different and stand out in the crowd or you will go unnoticed. 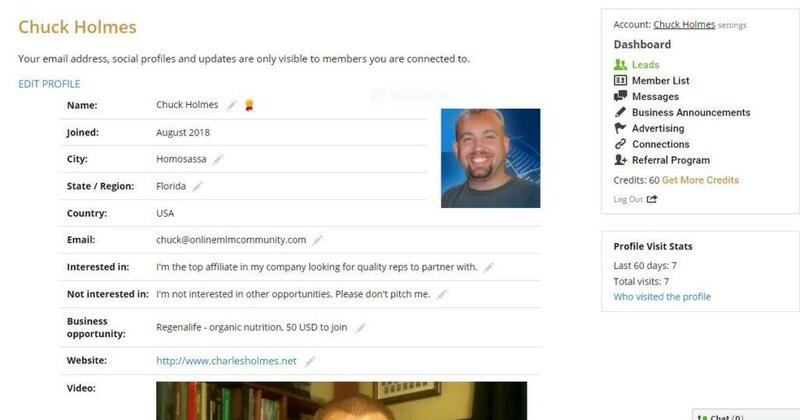 I’m registered on MLM Gateway and unfortunately haven’t benefited much from it because my business is UK based and most of the leads on there are based in the US. One of my business partners here has been on it much longer and has the same experience. Sorry to hear that. I’m getting a ton of leads with it. I’m a professional member doing lots of paid ads and business announcements. Avery good part of joining this gateway is that you can promote your business by writing business announcements and actually earn credits by doing so. You connect with like minds and can even reach out to prospects. You can also add your links too and get genuine and unique traffic. Yes, I just learned that you can write articles on MLM Gateway. I’ll be doing that myself in the very near future. Trust me, I registered on the site and I followed professionally, and the results are pretty great. It is a good platform to gain some great leads that would benefit you well. I’m glad you had a good experience with MLM Gateway. Thanks for sharing. A lot of users on the MLM gateway know that other users have an MLM business and are there to promote their business, so they obviously expect offers from other users. Of course. That’s part of being on the website. You will receive other offers. The key is to provide value and become a respect member of the MLM Gateway community. By doing that, you will attract prospects into your business. Yup, I keep telling people I send to the site that, just like any social media platform, you dare not spam other members just so you don’t get flagged and lose potential leads. There is no need to spam anyone on MLM Gateway. Just offer value and let people reach out to you. Wow! I really believe this is an excellent idea and I am definitely going to use it as one of my lead getting mechanisms to help boost mu MLM network. Thanks for sharing this! Glad you enjoyed the information about MLM Gateway, Pearl. It’s a great resource. After Greg wrote this blog post, I decided to check it out myself.